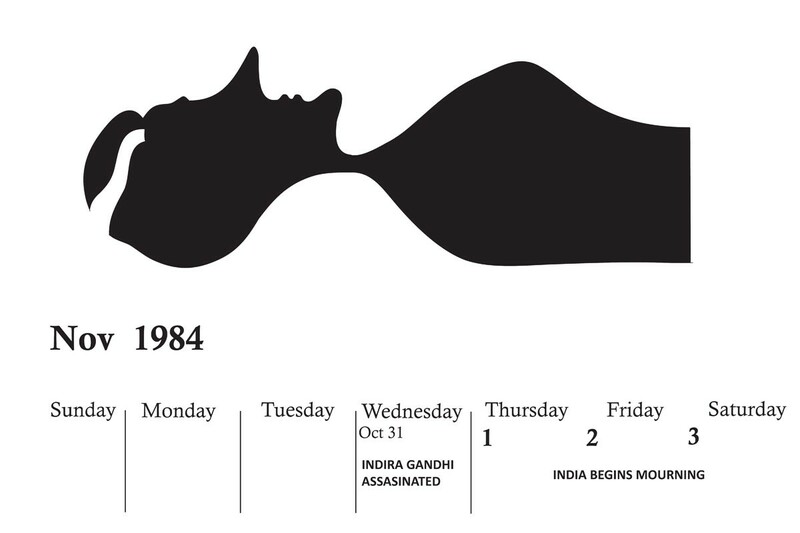 On October 31st, 1984 the Prime Minister of India, Indira Gandhi was assassinated by her two Sikh bodyguards. This event was a culmination of years of political conflict in the north Indian state of Punjab. Eventually Mrs. Gandhi would order troops into the holiest of temple of Sikhs, Darbar Sahib in the city of Amritsar to flush out armed dissidents. Of all the days she chose a day in June on the calendar when thousands of Sikh pilgrims were visiting to commemorate the martyrdom of Guru Arjan. The collateral loss of innocent life was a message in itself. Sikhs around the world were stunned by this well coordinated attack. The immense loss of life in the waning months of her life would not be the last of her legacy. Immediately after her death preparations began for one of the most organized state massacres of late 20th century. I was fortunate enough along with my family to survive this wave of brutality. 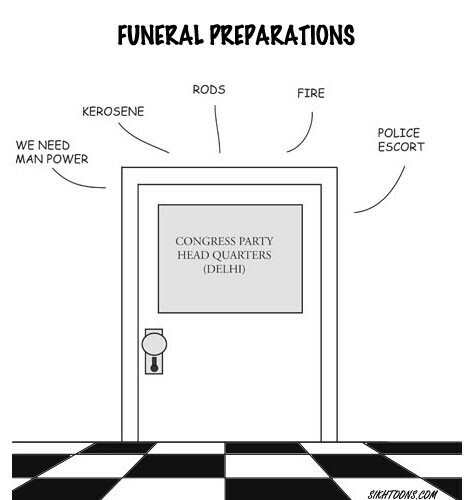 In the immediate hours after the assassination of the Prime Minister, funeral preparations began not for one body but many more whose number would be determined by the whims of revenge seekers. There was only one television in those days controlled by the government. As the nation mourned the television screen broadcast images of countless people streaming past the body of the slain leader with non-stop shouts in the background. “Khoon ka badla khoon se ledge”; “With blood we shall avenge blood”. 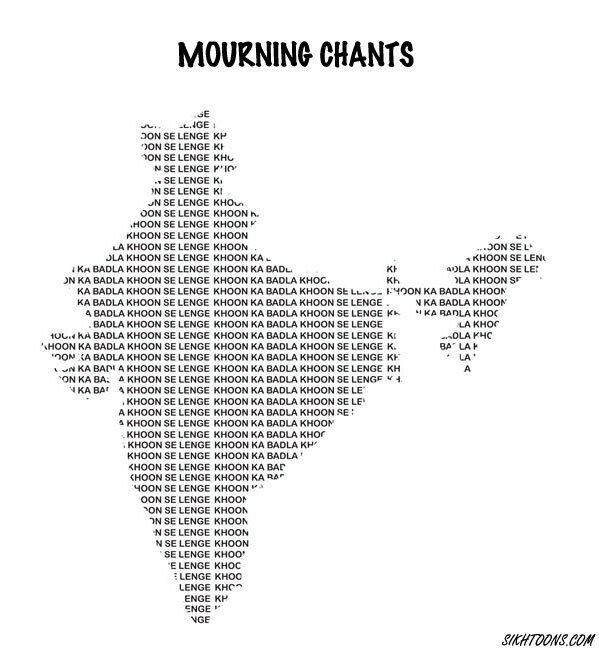 The entire nation soaked in this message from the television screen in the presence of political leadership, influential citizens and Bollywood icon Amitabh Bachchan. 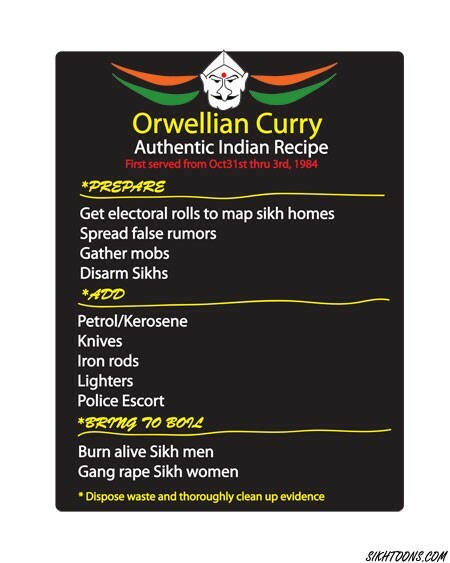 The calls for blood did materialize into a very Indian version of an Orwellian curry. The powers to be with all the big brother machinery were preparing for a roast of a very unique kind. While Sikhs were being hunted & killed, the political & security leadership had a long conversation about when to call the army in to put an end to this organized game of revenge. So what were the cops doing while mobs in cities across the north half of India did what even animals don’t do. They joined in, guided the mobs and provided security to who else, the killers. I saw this with my own eyes as police officers managed a mob of hundreds of men out for revenge. This is one of the most insidious ongoing aspects of this carnage. 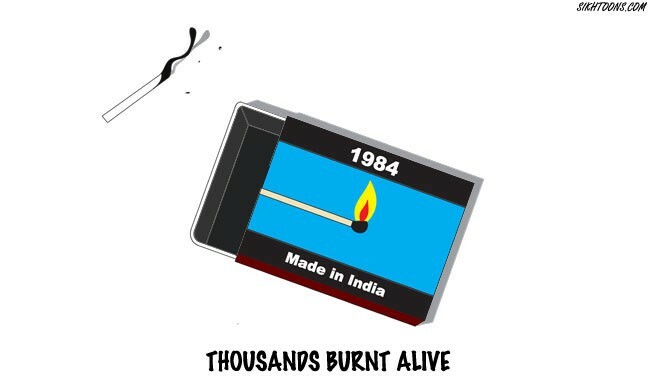 Sikh men in the thousands were burnt alive by having kerosene, petrol or rubber tyres forced upon their bodies and then with the flick of a match stick lit on fire. Somehow everyone in the halls of power, media and the intelligencia class decided to control this narrative by only focusing on the killings in the capital city ignoring countless killed in cities across the nation. The count of those killed will never be known. Life in nation of over a billion is cheap. What is a few thousand here and a few thousand there. 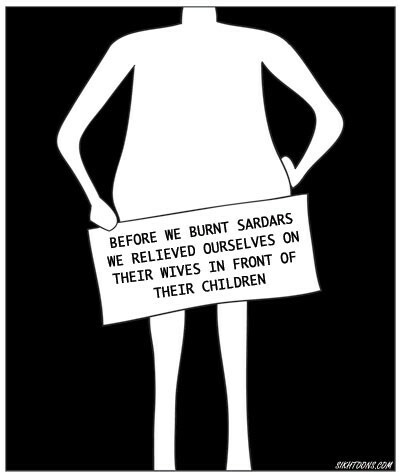 As if burning alive Sikh men was not enough to satisfy the pangs of ghoulish revenge, wives, daughters were violated by men young and old, many times over, in many instances before husbands were set on fire in the audience of their progeny. Somehow to scar the collective memory of those surviving was part of the grand plan. 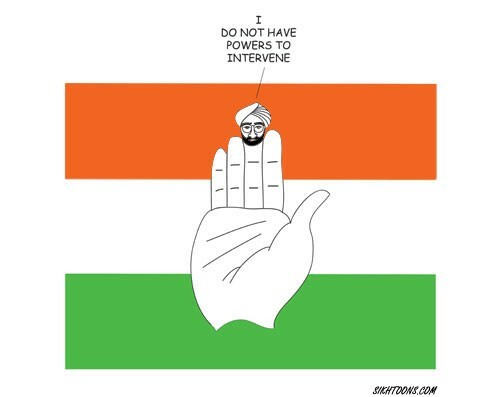 India’s president, a powerless nominal head of state was a Sikh man hand picked by the slain Prime Minister. His only response to this madness was to announce his powerless-ness. 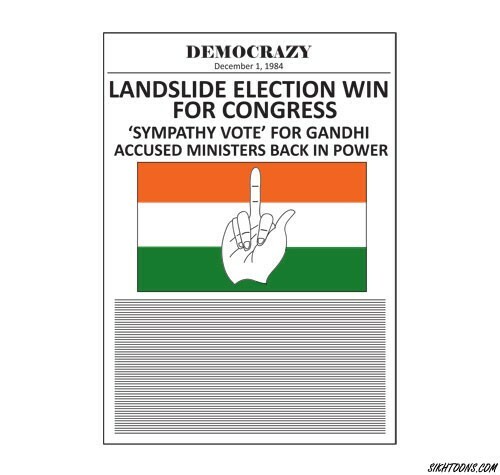 For those not familiar with Indian political system the hand is a official logo of the Indian Congress Party which was in power at the time. The newly annointed Prime Minister of India, the son of slain leader would address the nation few days after the carnage and the funeral. He used the famous words above to literally explain the root cause of the carnage. It was just as simple as a Newtonian law of physics. As if that quote was not enough the new Prime Minister went on to thank the masses that engaged in the carnage on their benevolence & discipline to bring things back to normal. These are his actual words. 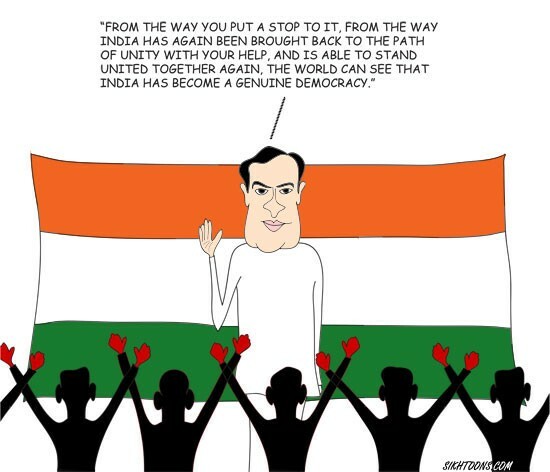 Just over a month later the people of India went to polls to hand one of the biggest landslide victories to the ruling party, that orchestrated the carnage and now found itself with an even bigger mandate to rule. The new government and all successive governments that came to power in the next 20 years engaged in one of the most ingenious and farcical judicial tricks. Powerless commissions composed of prominent citizens were asked repeatedly to present investigative findings about the culprits behind the Anti-Sikh massacre. The commissions were manhandled anytime they came close to truth by factually pointing the fingers back at those in power. Call it a comedy of ironies. 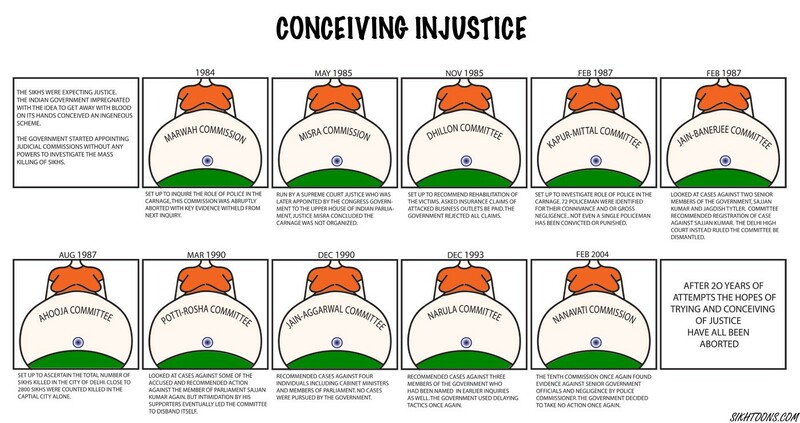 The 10th commission twenty years post the carnage implicated the political leadership of the ruling Congress Party. Its selected Prime Minister at the time was a Sikh man, Manmohan Singh. The blue turbaned mild mannered could not offer any hope for justice so instead he offered an apology. Those with blood on their hands stood behind him laughing at the ultimate Sikh joke. 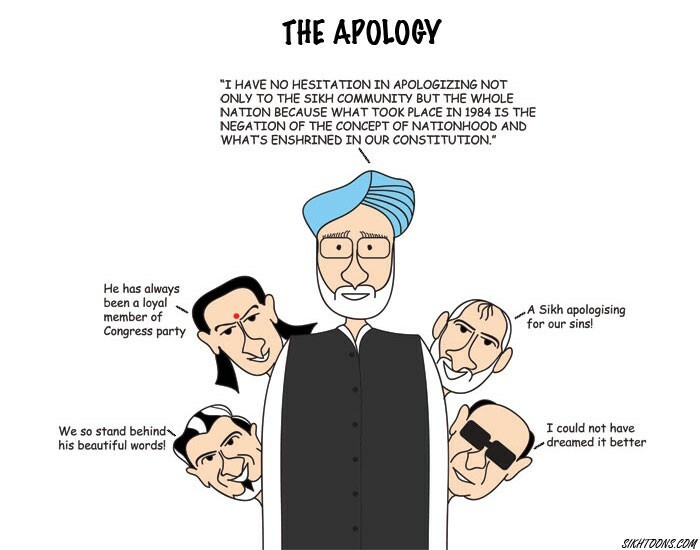 Getting a Sikh man to apologize for the massacre of thousands of Sikhs at the hands of his own political party. 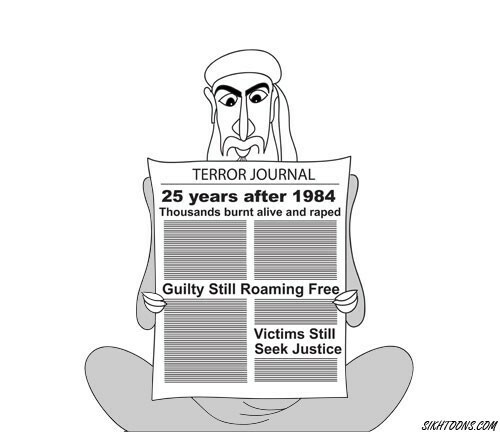 I could not help but imagine during the 25th anniversary of this pogrom even the mastermind perpetrator of 9/11 would be amazed reading the saga of this act of terrorism with those responsible, roaming freely in power, getting promoted, elected in a democracy. On the campaign trail after the 25th anniversary of this act of genocide, the Sikh Prime Minister of India had a message for Sikhs talking about justice. Just move on. Justice for him and many in India about the countless man made tragedies translates to ‘Just is’. We just have to accept these acts of human animals as part of life. 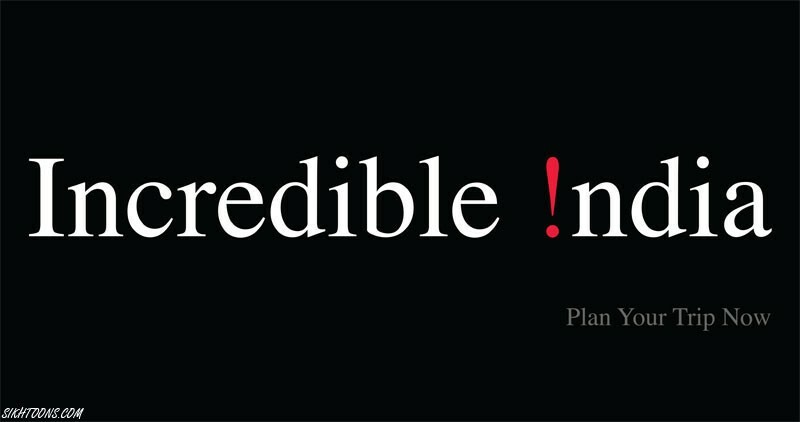 To borrow from its official global marketing slogan seen on posters across the globe, heard on radio announcements and many other marketing outlets, indeed it is Incredible India! The land known for its rich cultural, religious, musical, linguistic traditions among others is also incredible in wanton brutality against its own people. You can read about my journey surviving this carnage in words at the following link. 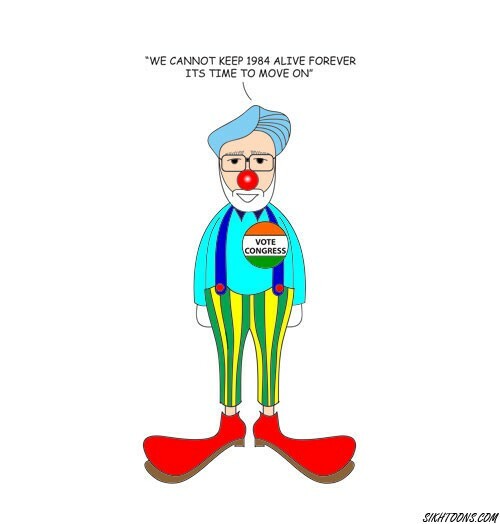 Visit Sikhtoons.com for more of my cartoon works along with writings & cosplay.